Growing up, Hal Elrod was average. He was never exceptional at anything. He was not an athlete, neither was he popular. At 19 years old, he wanted to become a nationally syndicated radio disc jockey (D.J.). He was deejaying for a small radio station when a kitchen knives sales job was presented him. He didn’t want to take the job. Later, he decided otherwise and it paid off: in his first ten days selling the cutlery, he sold more kitchen knives than almost anyone had ever done in the history of the company, within such a short time. The average young man was no longer average. His new found skills in sales marked a turnaround for him. A year and a half into his new career, he was giving a speech at a Cutco conference. It was a special moment for him when he received a standing ovation from the audience. However, as fate would have it, Elrod was involved in an accident on his way home from the conference. He was driving home in his brand new car when a drunk driver hit his car head on at a speed of 80mph. His car spun and another car crashed into it directly at his driver’s side door. He broke 11 bones. The pain was too much that he immediately went into a coma. It took rescuers an hour to cut him out of the car. And when they had finally got him out, he bled so profusely he was declared dead. For six minutes, Elrod was practically dead. He was in a coma for six days. During this time, he underwent several surgeries to save his life. He had significant brain damage and doctors told him and his parents he was likely never going to walk again. His parents were, understandably distraught. Hal was more optimistic. He told them he would be the happiest person in a wheelchair if he never got to walk again. All the same, his focus was on the possibility of walking again. “Call it a miracle, call it what you want. But it was a week later, three weeks after the crash… that I took my first step. And doctors actually came back with X-rays and they literally could hardly explain it. They thought I was in denial because I was so happy,” Elrod explains. Hal Elrod says when something goes wrong his five-minute rule helps him. This rule states when something goes wrong, it is okay to be negative, but not for more than five minutes. He says when something goes wrong, he sets his timer on his phone and for five minutes allows himself to complain, vent out and mourn about it. After the five minutes, he moves on after saying what he calls the magic words: can’t change it. Elrod had two mentors who shaped his thinking growing up. One was his parents and the other was his manager at Cutco. He says he watched his parents deal with the loss of a child. His little sister, Amery died at just one and a half years old. Elrod watched his parents turn that tragedy into triumph. His mother formed a support group to help other parents dealing with the loss of a child. He learned taking adversity and turning it into advantage. The manager at Cutco who inspired him taught him his five-minute rule. As soon as he got out of hospital, Elrod was back to work, against doctors’ orders. He immediately participated in a sales contest. Over a thousand people had participated. He took fourth place. 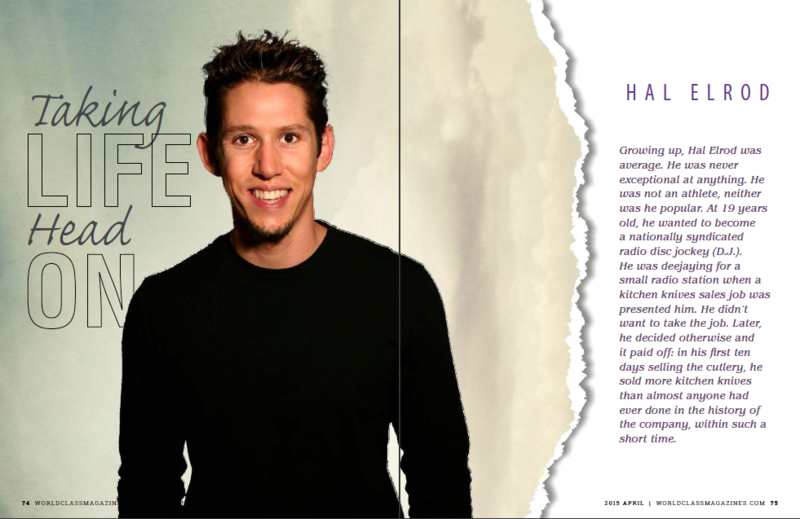 While he continued working at Cutco, Hal says the seed for motivational speaking had been planted. 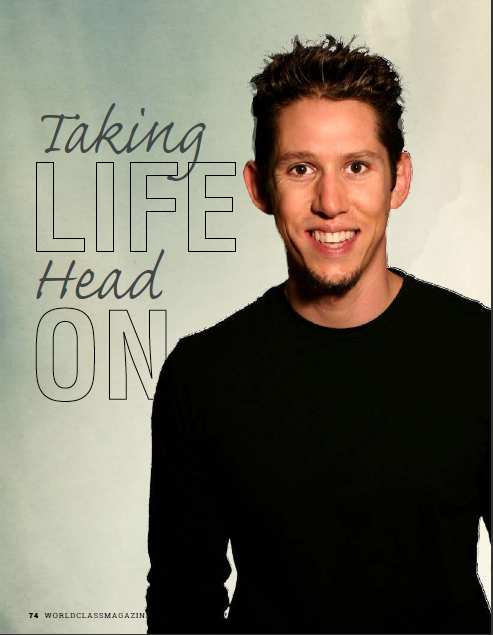 He wanted to inspire others with his recovery story. He stayed on at Cutco until he hit the hall of fame and then wrote his first book. The book, Taking Life Head On, became a best seller on Amazon. He began speaking in colleges and high schools. He taught the ABC’s of taking life head on: A for accepting the things you cannot change; B for being grateful for everything you have and C for creating consistent progress towards the life of your dreams. His life as a life coach had kicked off. He went ahead to achieve tremendous success. Soon, his coaching practice had a coaching program with over 200 coaching members. The big turning point in his life was still ahead of him. In the 2008 economic crash in the US, his financial life seemed to have followed suit. He lost over half of his income, he couldn’t pay his bills and he lost his house. He also stopped exercising and got in his worst physical shape. His emotional state was no better. He was depressed and suicidal. Elrod realized he was not dedicating time every day to his personal development; therefore, he was not becoming the person he needed to become to create the life he wanted. 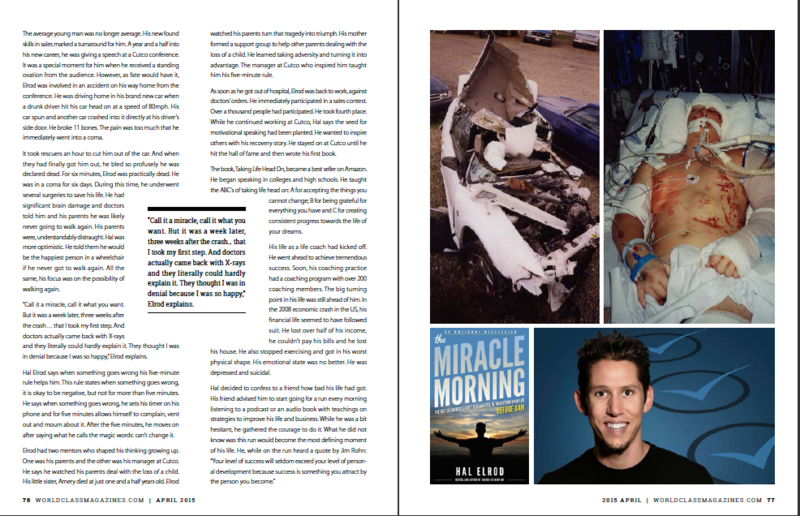 This is how he created his ‘Miracle Morning’. This morning routine changed his life. In just two months, he almost tripled his income and went from being in his worst physical shape to training for and running a 52 mile ultra-marathon. The stress and depression were gone. He started sharing his Miracle Morning with his clients and wrote ‘The Miracle Morning’ book that has become an Amazon bestseller. The Miracle Morning is made up of six practices he has organized into an acronym “Life Savers” to make them memorable. “Savers” is an acronym for Silence, Affirmations, Visualization, Exercise, Reading, and Scribing. Silence involves prayer or meditation. Affirmations are written statements that articulate what you want; why you want it and what you’re committed to doing to ensure that you achieve it. Visualization involves seeing clearly in your mind what you want to achieve. Exercise in the morning elevates your mood and energy levels for the rest of the day. Reading transformational books will help you take certain areas of your life to the next level. Scribing is journaling what you are grateful for and the things you need to achieve each day. Hal defines success as freedom to do what you want, when you want with whomever you want. If he was to interview three successful people, he says he would interview Tony Robins, Eben Pagen and Will Smith. Hal says his mission is changing people’s lives with his Miracle Morning. What fears have you overcome and how did you overcome them? What is your number one key to success? If you were me, what’s the first thing that you would do? Elrod says people with a world-class mentality are constantly improving while the average person is just trying to get by. To transition from the average mentality to a world-class mentality, Hal says people should put more effort into becoming more rather than doing more. While there are many lessons people can draw from his story, Hall believes the greatest lesson should be this: Love the life you have while you create the life of your dreams.